Daily rentals (to productions: film, TV, photographers) These harps have appeared in feature films such as Disney's "The Other Sister" with Diane Keaton, television spectaculars such as Celine Dion's Christmas special, television series including Picket Fences and Murphy Brown, and the "Dad paying for everything at the wedding with his Visa charge card" national TV commercial!! Insurance coverage certificate is required. Daily rentals (to visiting professional harpists) For harpists visiting Southern California to perform in a concert, recording session, audition, wedding, etc. We deliver and pick up a professional quality harp, for less than it would cost to ship your harp from out of state. Monthly rentals to harp students and professional harpists Rent a harp while you are learning, until you are ready to purchase one. Professional harpists may want a second harp to try out a different type or to leave at a steady gig. Schools, hotels etc may wish to rent a harp for the convenience of their harpists. 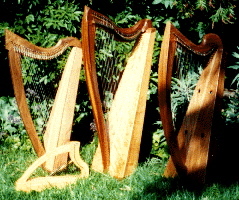 Quality lever harps of various sizes. Pedal harps sometimes available for monthly rental. Looking for a professional harpist, or harp teacher? We do not rent harps outside of Southern California.